Adenocarcinoma is cancer that begins in cells that line certain internal organs and that have gland-like (secretory) properties. As cancer death rates drop overall, doctors have noted a frightening anomaly: deaths from colorectal cancer in people under 55 appear to be creeping up. According to the American Cancer Society, deaths in this younger group increased by 1 percent between 2007 and 2016. Mutations that cause oesophageal adenocarcinoma have been mapped in unprecedented detail - unveiling that more than half could be targeted by drugs currently in trials for other cancer types. Researchers have developed a new cervical cancer test that proved to be 100% effective at detecting the cancer in a trial of 15,744 participants. According to health advisors from the U.S. Preventive Services Task Force, Pap smears may not be the only way to check for cervical cancer risk among women. A research team led by Gunnar Raetsch, Professor of Biomedical Informatics at ETH Zurich, has evaluated the largest set of genetic data in cancer medicine: The Cancer Genome Atlas in the United States. The rarity of appendix cancer, accounting for less than 1 percent of tumors that originate in the gastrointestinal tract, and the lack of scientific data for this disease means that current treatment guidelines recommend applying therapies to people with appendix cancer that are intended for those with colon cancer. Subsolid nodules can be considered a biomarker of lung cancer risk and should be managed with long-term active surveillance. Tumors that develop at the transition of the stomach to the esophagus, so-called adenocarcinomas of the gastroesophageal transition, are still difficult to treat and the chances of recovery are still low. A small study of adults with the most common form of pancreatic cancer adds to evidence that patients with BRCA1 or BRCA2 gene mutations long linked to a high risk of breast cancer have poorer overall survival rates than those without the mutations. Researchers have identified an enzyme that is absent in healthy colon tissue but abundant in colon cancer cells, according to a report in the Jan. 26 issue of the Journal of Biological Chemistry. For some cancer patients, the road to remission and healing can have its share of speed bumps. That's particularly true of patients with non-small cell lung cancer (NSCLC) who develop a secondary, or acquired, resistance to immunotherapy, which initially was effective against their tumors. Scientists from RUDN University have synthesized a number of new cytotoxic substances - the ones that can damage cells. 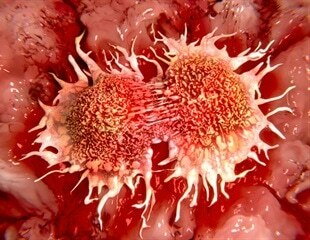 In the future the results of the study can be used in cancer therapy. Research conducted by a team of Norton Thoracic Institute scientists on a novel therapeutic avenue for an aggressive and difficult to treat subgroup of lung cancer was published in the August 15, 2017 issue of Cancer Research. A new study from the American Cancer Society has found that more people living in the United States of America are dying from colon and rectal cancers around the age of 50 years when they are supposed to officially begin screening for these cancers. The new study is published in the JAMA, the Journal of the American Medical Association.